One book not in my library is J.D. Salinger’s Catcher in the Rye. Never read the thing. It was never assigned in high school or college literature classes. My education was, as a result, entirely incomplete. I see now (from Wikipedia) that there is so much I never learned about literate whining. Catcher in the Rye was widely censored when I was in high school. Father Earl La Riviére, our 9th grade English instructor did push the envelope, as far as many parents were concerned, by assigning Taylor Caldwell’s Dear and Glorious Physician. Sure, it was, appropriately for a Catholic school, a novel about St. Luke’s coming to Christianity in time to write the third Gospel, but it had the distressing feature of describing the pre-Christian Luke as somewhat less than chaste. In the words of Father Earl, parents were annoyed that the pre-saint engaged in too much pre-marital “hoochie coochie.” We read it anyway. Dear and Glorious Physician is not in my library. Neither is much of what I read in high school. I don’t remember actually tossing George Eliot’s Silas Marner in the trash, but am quite sure I did as soon as it was convenient. Many of my subsequent book reports referred to Silas: “This book was the worst thing I’ve read since Silas Marner.” “This book was almost as boring as Silas Marner.” I’m sure I would appreciate it more now, but I’ve never given it a second chance. We were introduced to a large dose of poetry, all of it written by dead white guys. I don’t recall reading any Emily Dickenson at this time, and I’d already been introduced to Winifred Sackville Stoner, Jr.’s mind-numbing “In fourteen hundred and ninety two, Columbus sailed the ocean blue…” In Father Earl’s class, we had to memorize and recite most of what we read: Longfellow’s Paul Revere’s Ride, Noyes’ The Highwayman (horses evidently played a prominent role in my poetical instruction) and some less controversial poems from Whitman’s Leaves of Grass that made it into the curriculum. I remember that I was unable to completely recite the first 125 lines of Coleridge’s Rime of the Ancient Mariner. I think I got as far as Line 75 and then jumbled it up a bit. The darkness of Poe’s poetry (Annabel Lee, The Raven) appealed to me. It went on from there. It was a unique story that I thought deserved applause. While I can’t remember how it ended, I do remember the failing grade for plagiarism. Off the top of my head, I recall multiple assignments of Poe (both poems and short stories, including The Pit and the Pendulum), Hawthorne (House of the Seven Gables and The Scarlet Letter), and Dickens (A Christmas Carol, of course, Great Expectations, and A Tale of Two Cities). I was assigned Great Expectations again in college. On neither occasion did this coming of age story make much of an impression. I quickly ditched or re-sold both copies. With one exception, none of these novels, short stories, and poems made any impression that lasted much beyond the assignment or semester exam. Ahhh, but A Tale of Two Cities. How many novels open AND close with two of the most memorable sentences in the English language: “It was the best of times, it was the worst of times.” “It is a far, far better thing that I do, than I have ever done; it is a far, far better rest that I go to than I have ever known.” Dickens’ novel, heavily drawn from Thomas Carlyle’s History of the French Revolution (1837), is an intimate story of resurrection for one family and of redemption for its self-indulgent hero. The book is thrilling, increasingly so as the Reign of Terror grows in guillotine-driven ferocity. While many characters are not fully drawn, Dickens’s Madame Defarge is both understandably righteous in her wrath and figuratively vampiric in her unquenchable blood thirst. 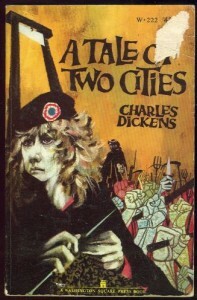 A Tale of Two Cities grabbed me like no other novel in my youth. But its real importance was that it introduced me to the French Revolution and subsequent Napoleonic era. I became fascinated by the behaviors exhibited by mankind at times when a stable social order is overthrown or in places, like the American frontier, where one has not yet been established. Men and women at their worst, at their best, and sometimes just trying to muddle through out of the way of bullets, blades, and disease. A Tale places an ordinary man, in this case a gifted loser, in the middle of great chaos and illustrates that individuals can and do make a difference. However ennobling is self-sacrifice, I recommend it be achieved without the presence of a wicker head-basket. I mentioned in an earlier post that my first and still unrealized effort at book writing was a survey of the French Army’s leadership during the revolutionary and Napoleonic eras. The chapters on how various generals navigated the Reign of Terror, or failed to survive it are my favorites. Maybe one day I’ll revisit the work and publish it.